Turnips are a root vegetable commonly associated with potatoes or beets, but their closest relatives are radishes and arugula, which, like turnips, are members of the mustard family. Large or old turnips can become unpleasantly "hot" unless properly cooked and combined with milder vegetables like potatoes, but younger turnips add a great zip to dishes, and are even tasty (and crunchy) raw. Find tips for choosing turnips and great recipes for making delicious use of them below. Turnips are available all year long, but are at their best in fall, when mature specimens are fresh, and spring, when they are small and sweet. Larger turnips necessarily develop tougher skins and a stronger flavor, but are great for mashing and/or adding to soups and stews. Like most root vegetables, turnips are a great storage vegetable to use when you want to keep eating locally throughout the winter. 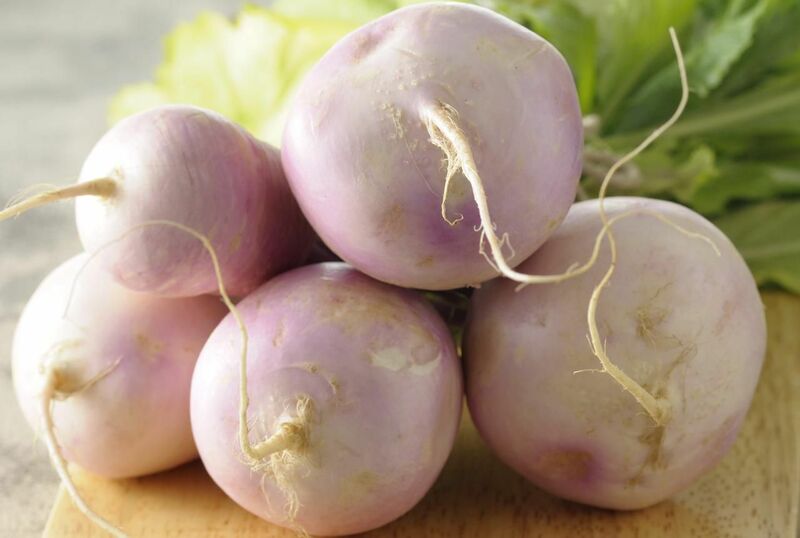 Look for brightly colored turnips with creamy looking bulbs and a violet-hued ring around the tops. Baby turnips may not have developed their violet tops and may look like somewhat large white spring radishes. In fall and spring, look for turnips with their greens attached to be sure they were freshly harvested. In winter, turnips will come from storage and their leaves will have been removed. In any case, you want firm turnips that feel heavy for their size and are without blemishes. If you buy turnips with their greens attached, remove the greens when you get them home. Clean, store, and cook the greens as any cooking green. Store the turnips loosely wrapped in a plastic bag in the crisper of the fridge or, if you're lucky enough to have one, loose in a root cellar. Like any root vegetable, they will be happiest in a cool, dark, dry environment. Contrary to conventional wisdom, turnips can be eaten raw. Baby turnips can be cut into wedges and served as crudites with dip, or sliced and added to salads for a crisp, lightly zippy tang (or made into a salad all on their own—just slice them thinly and drizzle on your favorite dressing). Turnips are more commonly cooked, however, and lend themselves to a variety of preparations. They are delicious roasted (a process that mellows and yet concentrates their sometimes watery flavor at the same time), mashed, baked, or added to soups (this Creamy Turnip Soup is a favorite) or stews. The "hot" flavor associated with turnips makes them particularly well suited to mixing and matching with other root vegetables or pairing with other strong flavors, as ginger. Add a turnip or two to your favorite mashed potato recipe, for example, or to a pan of roast vegetables.